A stunning synthetic diamond stacked ring featuring 5-7 rows of spinning, connected bands. Available options: platinum, 14k or 18k gold: white, yellow, rose. Each of Ada's bespoke fashion pieces are custom made to order. Our friendly Concierge are here to help you build a stunning piece of sustainable, conflict-free fine jewelry. Ada Diamonds Design Description- This gorgeous contemporary band features 5-7 rows of brilliant lab grown diamonds set in spinning, connected bands. Available in 14kt white, yellow or rose gold. The pieces below are already fabricated and are ready to be delivered to you within a few days. To buy one of these pieces, simply scroll down and click the 'Purchase' button to checkout. $3,600.00 Infinite brilliance meets striking design with this five row Spinning Stack Ring in 18kt white gold. 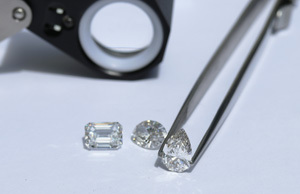 Includes 1.53ctw of GH VS conflict free, lab grown diamonds. Size 8.